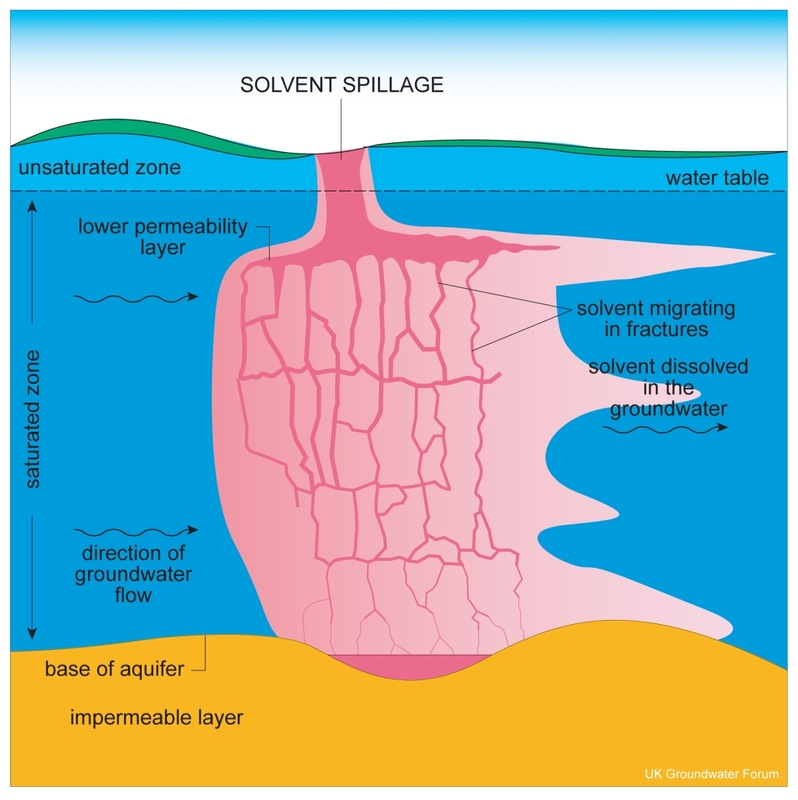 Water that occurs below ground and within the saturated zone of the strata is known as groundwater (P947892). 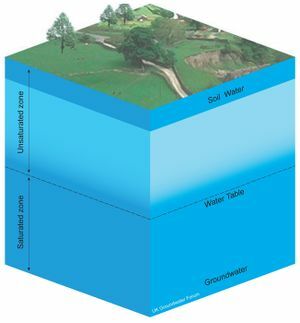 Bedrock and superficial deposits that store and transmit useful quantities of groundwater are referred to as aquifers. The study of groundwater and aquifers is the multidisciplinary subject of hydrogeology . Groundwater constitutes the largest volume of freshwater in the United Kingdom, and as such is an important national asset. In Northern Ireland, groundwater fulfils two significant roles. First, it augments bulk public supplies and provides private water sources to domestic, agricultural and industrial users. In recent years, groundwater has provided up to 11% of the public water supply . However, recent rationalisation has led to a reduced groundwater contribution estimated to be 6% of the 740 million litres currently used on a daily basis . Second, groundwater makes an important contribution to flows in rivers (baseflow) helping to sustain their resource, ecological and amenity value. The content of this chapter is based largely on the results of long-term investigations and a modern and practical understanding of regional groundwater distribution, potential and vulnerability. Much of the data depicts the hydrogeology and groundwater vulnerability of bedrock and superficial deposits in Northern Ireland , . Compared to other parts of the United Kingdom, investigation of groundwater in Northern Ireland has been limited, due partly to the dominant role of surface water for water supply. This is now changing due to greater environmental awareness and the requirements of European legislation. Groundwater in Northern Ireland is generally under utilised, leaving scope for future development in most areas. Under existing legislation, controlled water (including groundwater) must be protected both from pollution and over exploitation. The wide range of aquifer types present reflects the diverse bedrock and superficial geology. Potential for groundwater abstraction at a particular location will depend on the nature of the underlying strata (P947893), their potential to receive recharge, their ability to transmit water and the local structural complexity. Those in which intergranular flow is significant. Those in which flow is dominantly in fissures and other discontinuities. Those with limited potential, without significant groundwater. 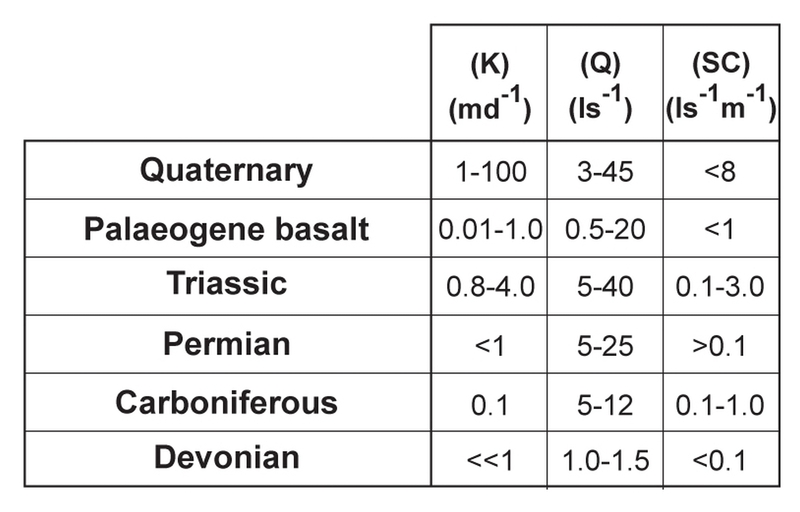 Class 1 includes highly productive and regionally important aquifers such as sandstones of the Triassic Sherwood Sandstone Group (see Triassic article). These sandstones have interconnected pore systems allowing significant intergranular flow although investigations have shown that fissure flow also plays a major role in groundwater transport. The potential of these rocks as a significant source of groundwater was first recognised around Belfast . In the Lagan Valley and around Newtownards, groundwater is abstracted for public water supply from both the Sherwood Sandstone Group and underlying Permian breccia and sandstone . Deposits of glacial sand and gravel that occur mostly in river valleys are represented in this class and constitute locally important aquifers where sufficient saturated thickness is present. Such deposits have supported yields sufficient for public water supply adjacent to waterways such as the Oona Water in Co. Tyrone and the River Main in Co. Antrim. Class 2 includes highly productive aquifers of limited extent and regionally extensive aquifers of local importance. Groundwater discharging from springs located at the base of the Cretaceous Ulster White Limestone Formation (see Cretaceous article) has been exploited for public supply. Investigations have shown that some of these are karstic conduits restricted to limited areas of exposure around the edge of the Antrim Plateau . In the outcrop of the lower Carboniferous rocks in the western part of Northern Ireland karstification of limestones and underground cave systems support major spring discharges  that also have been used for local public supply. This class also includes the basalt lavas of the Palaeogene Antrim Lava Group (see Mantle plumes, ocean spreading and the North Atlantic Igneous Province, Palaeogene extrusive igneous rocks article) that form an extensive aquifer system with low to moderate groundwater potential. Within the lavas, groundwater is contained primarily in fractures and joints whose interconnection generally determines the yield of a particular borehole (see Mantle plumes, ocean spreading and the North Atlantic Igneous Province, Palaeogene extrusive igneous rocks article), ( (P948026)). 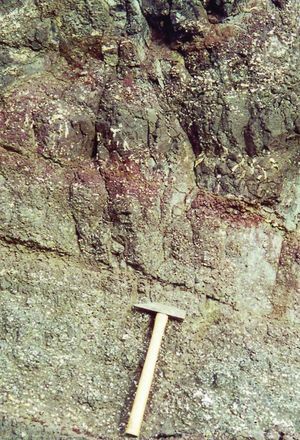 Class 3 strata are those with limited or no groundwater potential, such as the Devonian and Carboniferous red beds in the Fintona area of Co. Tyrone (see Devonian article and see Carboniferous article). Indurated metamorphic and igneous rocks also fall within this class and include the Dalradian rocks of the Sperrin Mountains and northeast Co. Antrim (see Central Highlands (Grampian) Terrane - metamorphic basement article) and the outcrop of Ordovician and Silurian greywacke and mudstone that extends southwest from the Ards Peninsula through Counties Down and Armagh (see Southern Uplands-Down-Longford Terrane article). Water movement through these strata is often restricted to near-surface discontinuities such as open fractures, faults, joints or bedding planes. Although their groundwater potential is minimal a significant number of wells and boreholes are located within them. Under favourable local conditions such wells can satisfy demand from domestic and agricultural users. A relatively high effective rainfall of about 500 mm/annum which is distributed throughout the year. The widespread distribution of clay-based till and gley soils. 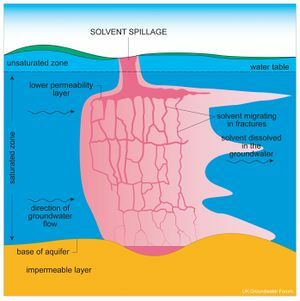 Potentially productive aquifers are often concealed by low permeability strata. Although the permeability of gley soils and glacial till is low, as soil moisture is at or near field capacity for a significant part of the year, some recharge of underlying bedrock aquifers can still occur. The last two factors combine to limit the regional resource value of groundwater . Hydraulic conductivity (K)—the measure of the ability of a rock to transmit water. Specific capacity (SC)—the measure of the efficiency of a borehole to deliver water. The most favourable hydraulic properties are found in Quaternary deposits and in the Sherwood Sandstone Group. In contrast the Palaeogene basalt lavas, Permian, Carboniferous and Devonian rocks are all limited by low hydraulic conductivity and specific capacity which reduces aquifer potential. Although fossil soils or boles in the basalt lava succession can provide significant hydraulic conductivity for lateral transport of groundwater, they have little potential for storage. In the Lagan Valley, hydrogeological studies and more recently a combined geochemical and groundwater modelling investigation identified a complex regional aquifer system in the Sherwood Sandstone Group, with groundwater flow influenced by the presence of faulting and Palaeogene . A baseline hydrogeochemical survey of major ions in groundwater in Northern Ireland has demonstrated enrichment in calcium and bicarbonate, with slightly raised levels of sulphate . Most groundwater is weakly to moderately mineralised and oxygenated, although reducing conditions do occur locally. All groundwater tested was in the pH range of 4.7 to 9.0 with most samples between 6.8 and 7.8. Alkaline groundwater is invariably associated with limestone bedrock and with carbonate-cemented rock types. There is a general regional consistency in the chemistry of groundwater from aquifers in different rock types. It is believed that the water-rock reaction processes are incomplete and that most groundwater in Northern Ireland is relatively immature and subject to active recharge . 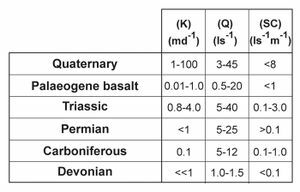 In the Sherwood Sandstone Group of the Lagan Valley geochemical investigation using isotopes indicate the existence of ‘compartments’ within the aquifer containing groundwater around 3-4000 years old . Groundwater contamination, whether by point source or diffuse pollution, can represent a serious threat to human health and can impact on associated surface water ecosystems. Typical incidents of point source pollution include chemical spillages (P947894), discharges from poorly sited or maintained septic tanks, and leakage of leachate from landfill sites. Diffuse pollution is a much more insidious threat and includes long term, over-application of agricultural fertilisers, uncontrolled use of pesticides and leakage from sewerage systems. Because the migration of contaminants into aquifers can be measured by time-scales from hours to tens or even hundreds of years, an understanding of the properties of all aquifers and overlying strata is important in helping to predict the movement and distribution of that pollution. The increasing use of nitrate as an agricultural fertiliser has resulted in its occurrence in some private and public groundwater supplies. Regional groundwater monitoring has also identified microbiological contamination at certain boreholes probably arising from poor wellhead protection measures and inappropriate siting of septic tanks and waste storage/disposal areas. 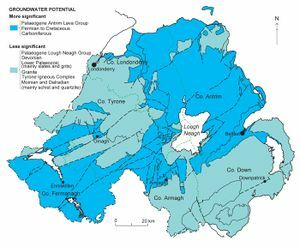 The groundwater vulnerability map for Northern Ireland  provides baseline information on aquifers, superficial deposits and soil types that help in defining the measures required for the protection of aquifers . In Northern Ireland, the most productive aquifers are also the ones that are considered to be at most risk, particularly where they are close to the surface. Recharge of water is usually greatest to such strata. However, the presence of soil cover and thick layers of low permeability deposits such as clayey till can protect these aquifers, but the natural variability of such deposits makes understanding their influence problematical. Groundwater in less productive aquifers can also be affected when the dominant fracture flow and shallow nature of the groundwater systems transmits contaminants rapidly to nearby wells and waterways. Although the role of groundwater for water supply is less extensive in Northern Ireland than for other parts of the United Kingdom and Ireland, it remains an important resource that requires sustainable management and protection from polluting activities. ↑ Price, M. 1996. Introducing Groundwater (Second Edition). Chapman & Hall. London. ↑ Robins, N S. 1997. The Role of Groundwater as a Strategic and Economic Asset in Northern Ireland. The Journal of the Chartered Institution of Water and Environmental Management. 11, 246–50. ↑ Water Service. 2002. WATER providing for THE?FUTURE. Northern Ireland Water Resource Strategy 2002-2030. ↑ Robins, N S. 1996. Hydrogeology of Northern Ireland. (London: HMSO for the British Geological Survey). ↑ 5.0 5.1 British Geological Survey. 1994a. Hydrogeological map of Northern Ireland. 1:250 000. (Keyworth: British Geological Survey). ↑ 6.0 6.1 British Geological Survey. 1994b. Groundwater vulnerability map of Northern Ireland. 1:250 000. (Keyworth: British Geological Survey). ↑ Hartley, J J. 1935. The underground water resources of Northern Ireland. The Institute of Civil Engineers, Belfast District Association pamphlet. p.31. ↑ 8.0 8.1 Bennett, J R P. 1976. The Lagan Valley hydrogeological study. Geological Survey of Northern Ireland Open File Report No. 57. ↑ Smith, A. 1985. Geological results of the Lagan Valley Groundwater Development Programme 1977–1984. Geological Survey of Northern Ireland Open File Report No. 71. ↑ Kalin, R M, and Roberts, C. 1997. Groundwater Resources in the Lagan Valley Sandstone aquifer, Northern Ireland. The Journal of the Chartered Institution of Water and Environmental Management 11, 133–39. ↑ Barnes, S, and Worden, R H. 1998. Understanding groundwater sources and movement using water chemistry and tracers in a low matrix permeability terrain: the Cretaceous (Chalk) Ulster White Limestone Formation, Northern Ireland. Applied Geochemistry, 13, 143–53. ↑ Karst Working Group. 2000. The Karst of Ireland; Limestone Landscapes, Caves and Groundwater Drainage Systems. Geological Survey of Ireland, Dublin. ↑ McNeil, G W, Cronin, A A, Yang, T, Elliot, T, and Kalin, R M. 2000. The Triassic Sandstone aquifer in Northern Ireland: constraint of a groundwater flow model for resource management. In: Robins, N S, and Misstear, B D R (eds.). Groundwater in the Celtic Regions: Studies in Hard Rock and Quaternary Hydrogeology. Geological Society, London, Special Publication 182, 179–90. ↑ Robins, N S, Trafford, J M, and McKenzie, A A. 1994. Hydrogeochemical survey of Northern Ireland with particular regard to major ions. British Geological Survey Report, WD/94/62. ↑ Robins, N S. 1998. The Quality of Shallow Groundwaters in Northern Ireland. The Journal of the Chartered Institution of Water and Environmental Management. 12, 163–69. ↑ Environment and Heritage Service. 2001. A Policy and Practice for the Protection of Groundwater in Northern Ireland. Belfast. This page was last modified on 25 September 2017, at 13:31.